"Far As The Curse Is Found," an original drama by Matt Hoffland. Ticket Hotline at (715) 427-5284 on Tuesday, October 23rd at 8 a.m.
"From the customer's vantage point, it appeared that the hiring of a new management team, just prior to the holiday shopping season, was just what the struggling Van Allen department store needed in order to survive another year. However, behind the scenes, strained relationships, stolen money and a new suspicious, austere top executive have all become factors to feed the rising tension between the store's administration and the security charged to protect it." Tickets go on sale 8:00 a.m. Tuesday, October 23, 2018. Tickets can be purchased by calling our Ticket Hotline at 715-427-5284. Tickets are reserved by making a credit card purchase over the phone, or in person at Forest Springs’ office. Otherwise, a check may be mailed and the tickets will be reserved once payment is received. Tickets will be mailed to you in a timely manner. 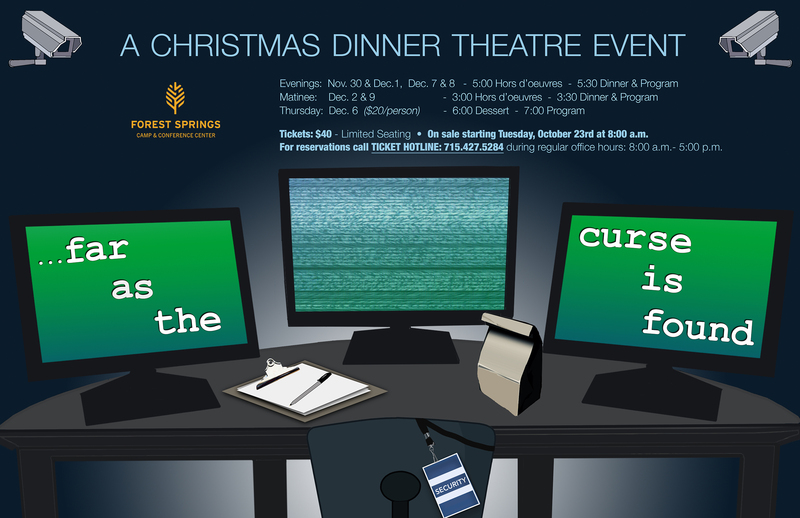 The weekend evenings and matinee includes a wonderful time of hors d’oeuvres followed by a multi-course fine dining experience and this full-length theatre presentation. Thursday evening begins with a delicious dessert followed by the program. The event is designed for those 13 years and older. No refunds will be given, however ticket-holders may sell or give away their tickets to others as they choose. Concerning Children - We want you to enjoy a wonderful time away without your normal family responsibilities. Please find care for your children so that you and others can enjoy your time away from it all. Tickets go on sale at 8 a.m. on 10/23.